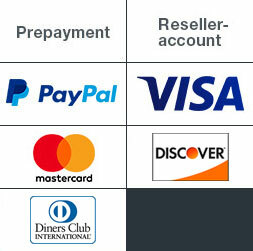 We promise every first-time customer of PrintCarrier.com: 100% satisfaction or 100% of your money back! Up to an order value of £165 incl. VAT, if our products fall even slightly short of your expectations, you can return them to us and we will give you a full refund. You can count on it! The point of our 100% satisfaction guarantee is to give you an opportunity to put our quality commitment to the test – without any risk to you whatsoever! If you are unhappy with what you have received from us, simply send all of the merchandise back to us together with a completed return form within five days. As soon as they arrive here, we will credit the full value of the returned goods to your account. And for a fee of only £10, we will even arrange for their pickup and return transport. Please note that this offer does not apply to jobs printed on the basis of artwork that does not meet our requirements. It is also limited to your first order from PrintCarrier.com.